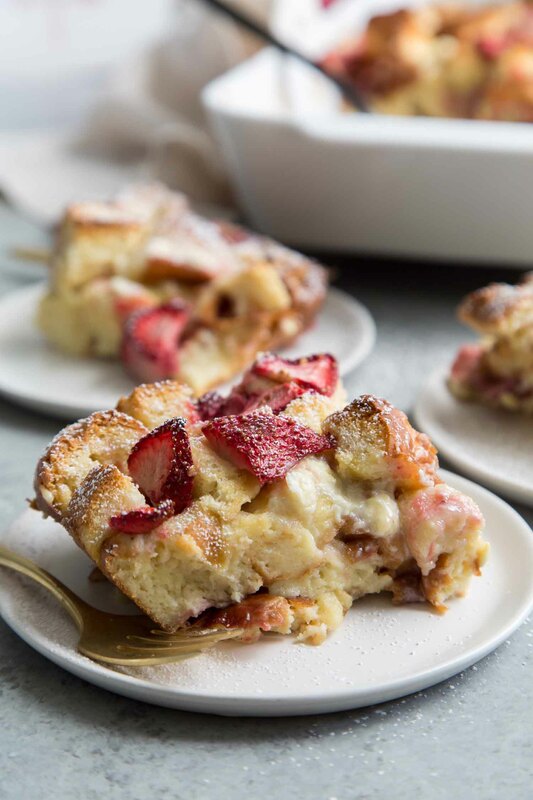 This super easy to make white chocolate strawberry bread pudding is made with hamburger buns! I hate to waste food. I will find a way to repurpose ingredients or give new life to leftovers. Clear the fridge bread pudding is a perfect example. Whenever I’m going away on vacation, I collect everything perishable out of the fridge and bake up a savory bread pudding. 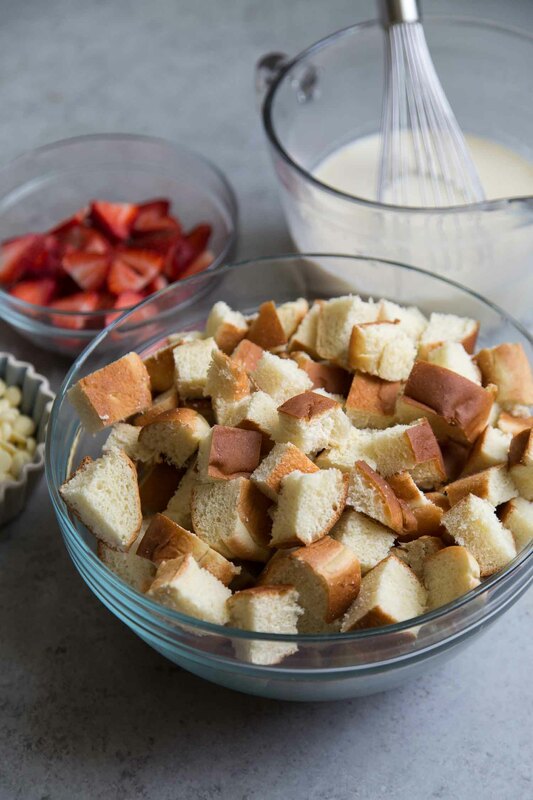 Bread, milk, and eggs are staples in most kitchens and those three ingredients also happen to be the foundations of bread pudding. What to do with leftover hamburger buns? Make bread pudding! 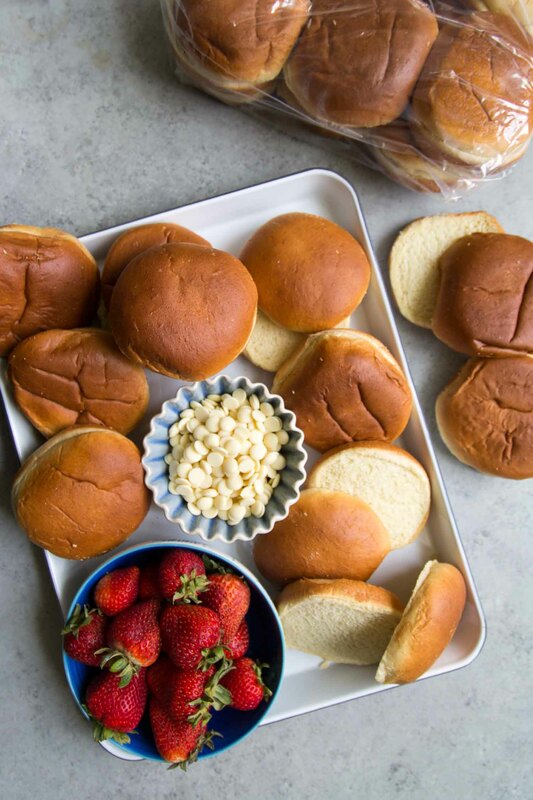 As summer and grilling season approaches, you’re bound to have leftover hamburger buns (or hot dog buns) after parties, gatherings, and barbecues. Rather than continue eating burgers for days, use that bread to make something sweet! Can you use other breads to make bread pudding? YES, of course! Ideally, a rich bread like brioche works best. However, you can use all sorts of breads: hot dog buns, bagels, challah, sourdough, and even croissants and pound cake. It’s best to use older (almost stale) bread instead of fresh baked bread. Dried out bread is better suited for absorbing the liquids in bread pudding. Slice bread into equal sized portions to allow for even baking. Most store-bought hamburger buns and hot dog buns are a lighter variety of brioche bread! Bread pudding consists of three components: bread cubes, custard mixture, and mix-ins. The custard mixture is made by thoroughly whisking together milk, cream, eggs, sugar, and pure vanilla extract. You can use a whisk, blender, or immersion blender. Essentially, the eggs should be well incorporated and the sugar should be dissolved. I prefer the latter because I can evenly distribute the mix-ins. 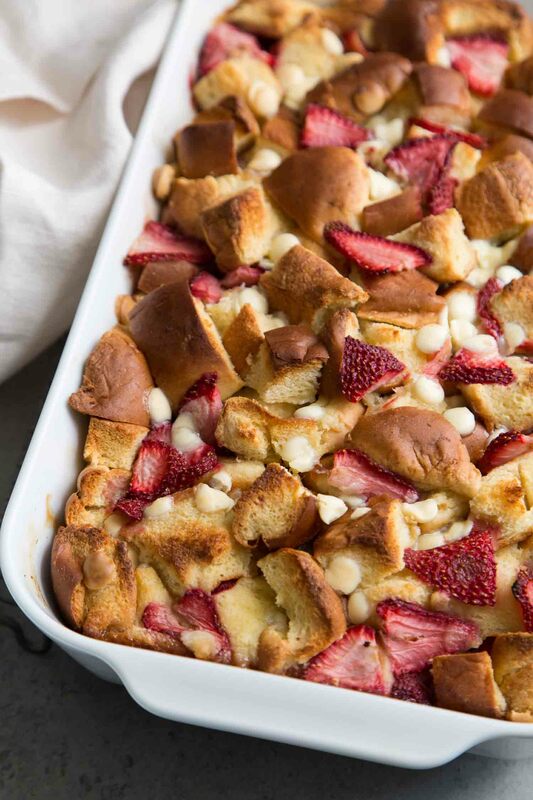 The assembled strawberry bread pudding needs at least an hour (up to overnight) to rest. The bread needs time to soak up all the liquids. I have found 90 minutes at room temperature is the sweet spot for this recipe. If you’d like to let it rest longer than that, cover the baking dish with plastic wrap and store in the fridge. Allow the baking dish to come to room temperature before baking. Because bread pudding is egg-based, it should be cooked “low and slow” to prevent any unwanted “eggy” taste. Allow the baked bread pudding to cool slightly before digging in. 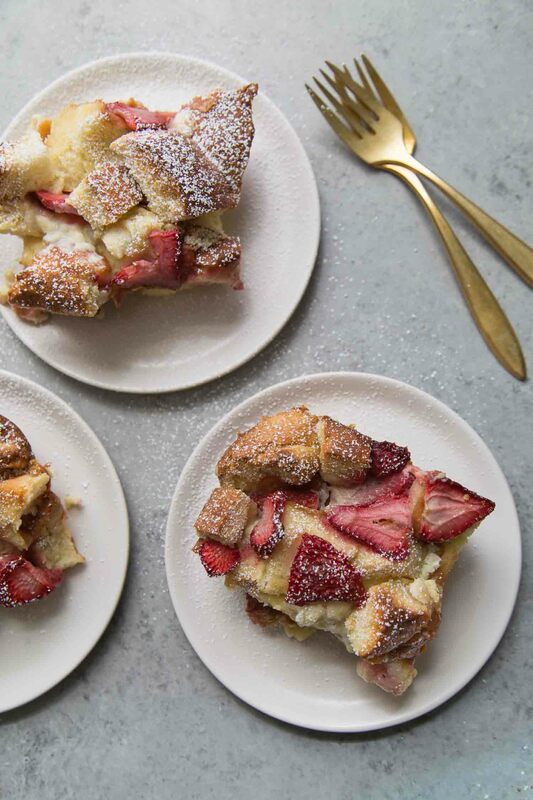 This white chocolate strawberry bread pudding can be eaten as is, dusted with sifted powdered sugar, or with a scoop of ice cream or a dollop of whipped cream! In a medium bowl, thoroughly whisk milk, cream, eggs, sugar, vanilla, and salt. 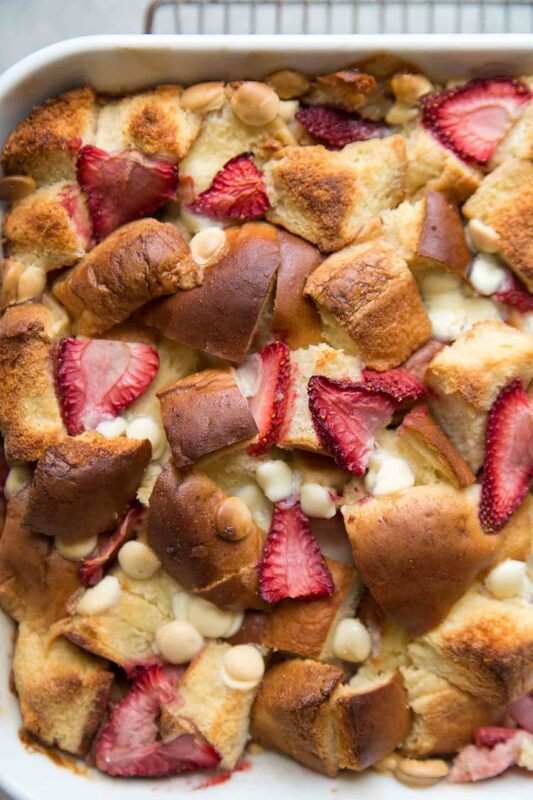 In another large bowl, toss together bread cubes, strawberries, and white chocolate chips. Pour in liquid mixture and fold to combine. Transfer pudding batter into shallow 3-quart baking dish (15 x 8 1/2-inch rectangle baking dish). Cover with plastic wrap and allow mixture to rest for one hour at room temperature. For longer storage, keep chilled in the fridge overnight. Preheat oven to 350 degrees F. Bake for 43-45 minutes until the top layer of bread is toasty and pudding is set in the center. Serve warm as is, or dust with powdered sugar. 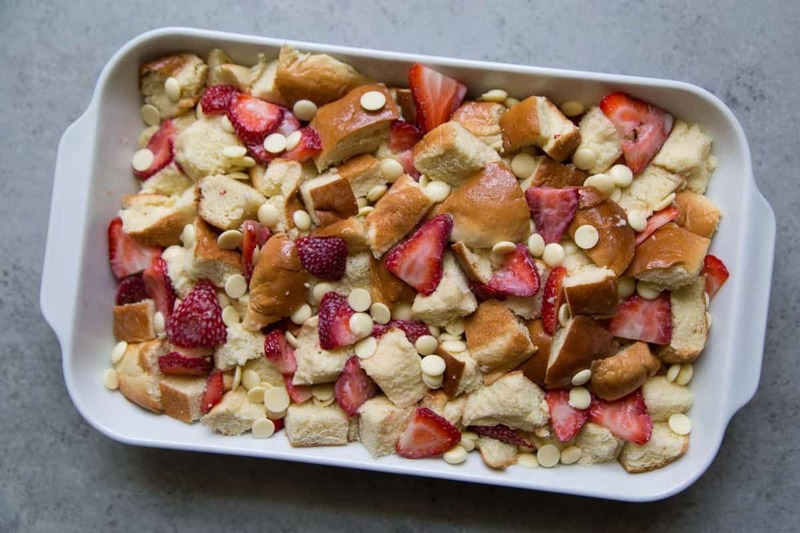 Alternatively, you can assemble bread pudding by alternate layering bread cubes, strawberries, and white chocolate chips in baking dish and slowly pour custard mixture over. Bread pudding can be served warm, room temperature, or chilled. Store leftover bread pudding covered in the fridge. Will keep for up to 4 days. Interested in other bread puddings? I love this idea and hate wasting food, too. This look so delicious and the perfect summer treat!